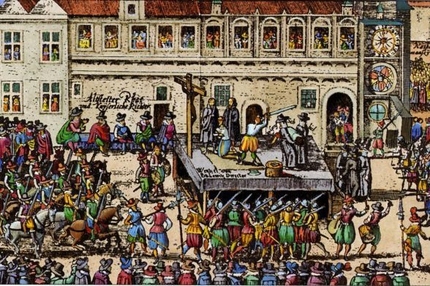 On June 21, 1621 a huge crowd gathered in Prague’s Old Town Square to view the execution of twenty-seven noblemen involved in the Estates Uprising the previous year. The main leaders of the uprising faced a special tribunal whose decision was confirmed in Vienna by the emperor Ferdinand II. On 21st July 1621 27 representatives of the rebellious Czech estates – three lords, seven knights and 17 townsmen, 22 Czechs and five Germans by nationality – were executed on the Old Town square to warn any others who would try to follow them. Bodies of few of them were quartered and then hanged around the gallows and pillories on today’s Wenceslas square, Charles square, Old Town square and Lesser Town square as a warning.